Welcome to week 34 of #thesatsesh .This weekend I plan on focusing on breathing, seriously that week was like surviving a whirl wind. You know you’re old when you’re excited because you don’t have any plans…thats my weekend, so I’m going to feel it with chill time, forrest walks and some meditation. Anything more and I’m not sure I could cope. 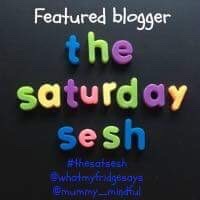 Each week myself and my super mum cohost Hayley pick a featured blogger each, you can click here to see who she has picked, or keep reading as I reveal mine. My featured blogger really got me thinking about boredom. Andy from Dads sofa discussed the issue, so much so that I think I might write my own post on the topic. You can read Andy’s interpretation here. In essence how reliant we are on our mobile devices for entertainment and to kill those awkward waiting moments in the day…some children need them to occupy them in queue’s or restaurants but actually theres a learning curve in waiting, in patience and in occupying yourself. Andy’s post is simple and to the point, I always enjoy his humour and would definitely like to sit on his sofa at some point in the future and share a cuppa. I imagine its full of laughter and moments of pure joy…who knows perhaps we could just chill and share some boredom time? Its week #32 and I am thrilled, last week the community was buzzing with so many good posts, it was really hard to pick a featured blogger, but also super fun to read the various genre of posts and peoples passions that joined us. If you regularly or perhaps occasionally join us, I’d like to dedicate week 32 to you – thank you for making this linky so joyful to run. It should perhaps feel like another ‘to do’ on the list of doom but is much more a task of ‘cant wait to do’ and thats always a sign that you’re on to something special. I did eventually pick a featured blogger, a Dad with a beard that impressed me – seriously if I was a man, or in my next life, I’m rocking a beard of joy; like Enda’s – its his blog endastories that I’ve selected this week. The post is all about singing, but as he write’s there were lines of pure joy that made my heart sing. I loved his unique style and passion for something many of us don’t realise we do…I know I sing because my son frequently screams at me to stop, but Enda’s approach to the mundane filled with me delight. Don’t take my word for it, click the blue link above and read it for yourself. Below as always are a reminder of the rules, please don’t link and run – commenting is caring and if you enjoyed my featured blogger, you may also want to take a peek at Hayleys cohost too. Just click here.